Heat the oil in a large saucepan over medium heat. Add the onion and garlic and cook for 4–5 minutes or until softened. Add the ham hock, water, tomato purée, thyme and parsley and bring to the boil. Reduce heat to low and cook for 1 hour. Remove the thyme and parsley and discard. Remove the ham hock and allow to cool slightly. Increase heat to medium, add the celery, carrot, swede, turnip and lentils and cook for 30 minutes. Shred the ham meat and set aside. Add the pasta to the soup and cook for a further 8 minutes. 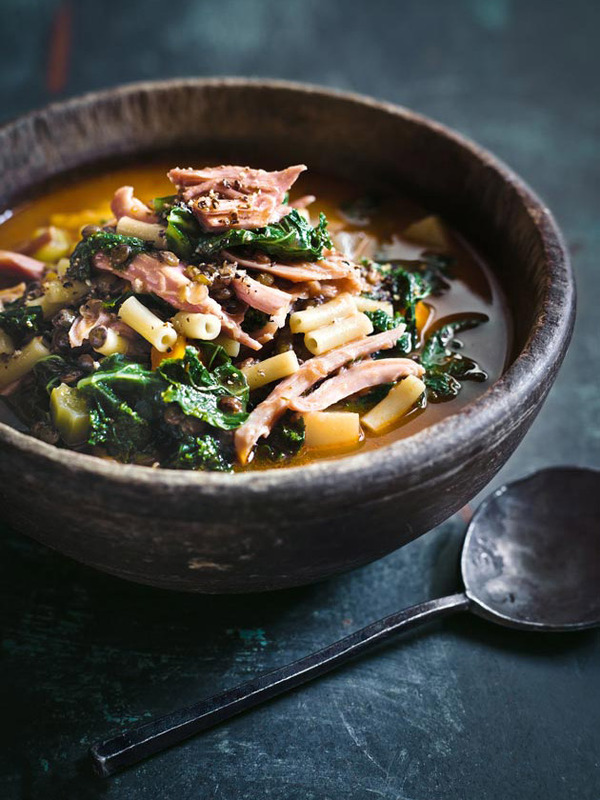 Add the kale, shredded ham, salt and pepper and cook for 1–2 minutes or until the kale is softened. Drizzle with extra oil to serve. Serves 6–8. + Puy lentils are a small, green lentil with a peppery taste. They hold their shape well while cooking.